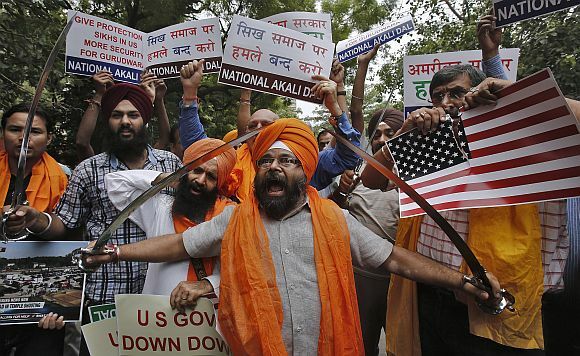 Dr Rajwant Singh, a high-profile Sikh American community leader, has blasted protestors in New Delhi who have taken to burning the American flag and shouting anti-US slogans outside the US embassy, calling it totally counterproductive to the perception of Sikh Americans. He said, "These people, they are some sort of hired goons by some interest groups --which I have no idea of -- but they are causing so much harm to the image of the Sikhs as well as the interests of the Sikhs in the United States and throughout the world." 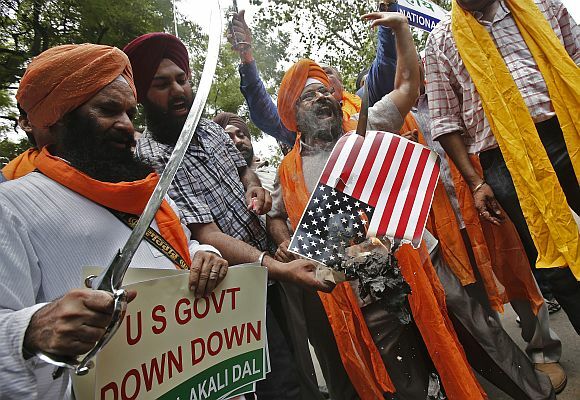 Singh said, "These guys brandishing swords and burning the US flag, it is absolutely outrageous." 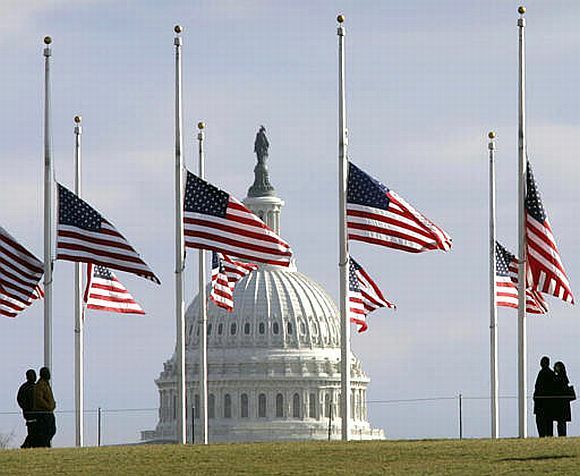 "Here the whole nation is flying the flag at half-mast in honour of the victims and these stupid guys are burning the US flag and raising slogans against America -- it is simply ridiculous and outrageous," he said, and added, "It is totally counterproductive to what we are trying to portray here." Singh said, "We are trying to show that we are a community of peace and equality and outreach and welcoming to all other faiths and religions and these stupid idiots with their swords and burning of the US flag are portraying Sikhs are some frenzied radicals." He said, "I have looked at the website of these guys who call themselves the National Akali Dal and its has three pictures -- honouring Sonia Gandhi, honouring Manmohan Singh and honouring Abdul Kalam. And now they are burning the flag of America, they are burning the flag of France, they are burning the flag of Australia. I just don't know what they are trying to do there and what their agenda is." Singh bemoaned that in the last few days after the massacre, the media has been showing these images (of the protests) too and this can only do immense damage to the perceptions of Sikhs in America "at a time when we are suffering and mourning and grieving the loss of our brothers and sisters so much here and at a time when the American people are also grieving with us and holding candle-light and prayer vigils in solidarity with us." He said, "We are so thankful for this outpouring of support during this difficult time and these protesters in India are operating under assumptions that are simply not true. We have been embraced across the nation." American support for Sikhs indeed has been global, observed Singh. "We are grateful that US Ambassador to India Nancy Powell paid her respects at a Sikh gurdwara in New Delhi and that Secretary of State Hillary Clinton reached out to her Indian counterpart as well." In an exhortation to the US media that have been showing images of the protestors, Singh said, "The protesters in India do not speak for Sikh-Americans and thus should not be portrayed as having anything to do with the shootings and its aftermath. I urge the media to not give these protesters the attention they are seeking or give credibility to their unfounded and wrong views." Singh said, "The Sikh community's response in the United States has been one of optimism and inclusion. For example, we have asked all Americans to join us in candlelight vigils honouring the victims and in our services this Sunday (exactly one week after the horrific attacks by white supremist at local gurdwaras). Our attempt to engage one another peacefully should be contrasted with the uninformed theatrics of those in India." "We are also surprised that the Shromani Akali Dal, the political party in Punjab or Akali Dal in Delhi, who supposedly looks after the issues of the Sikhs, have nothing to say against outrageous theatrical acts of these goons. Why are both Akali Dals keeping quiet?" he asked. 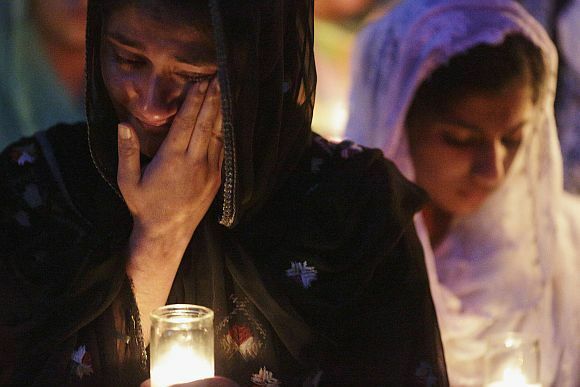 He added, "Sikhs in the US are working day and night to create better understanding of the Sikh faith and this kind of negative acts are harmful for the community and might endanger further lives." Singh's sentiments were echoed by a leading law professor Dawinder S Sidhu, also a board member of SCORE, who noted that President Barack Obama's order that "American flags be flown at half staff in honour of the victims of the shooting, is a gesture that reflects the extent to which Sikhs have been supported."